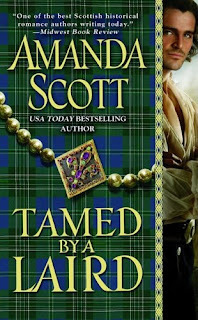 Thanks to Anna Balasi from Hatchette Books, I am able to give away 5 copies of Tamed by a Laird by Amanda Scott. OOOHHH, a romance and drama. Usually not what I read, but would love to try something different. I would love to read this book~sounds like something I would really enjoy! This book sounds wonderful.Please enter me in the giveaway..augustlily06(at)aim(dot)com. Thanks for the chance to win . Following you. My birthday is July 1. Would love to win. Thank you. Please enter me. I am a follower. Thank you. I'd love an entry. I am a follower. Hi, this is Shauna at Read~Write~Review again, I forgot my email. I'm at slkcivilrwr@gmail.com. Thanks! Please enter me in this contest. I am also a follower. So many awesome contests on your blog. I have to enter this one as well. Tamed by a Laird sounds great, please count me in.